So, for starters, it’s not a dream. I know what a dream sequence looks like on Dark Shadows, and that isn’t what this is. Carolyn’s eyes are open, and she’s sitting on the couch. This is some kind of wide-awake Chromakey phenomenon that they apparently have in this parallel band of concurrent time when they want somebody to think about something, but they don’t have time to put her to bed. In this weird green-screen memory mashup, Carolyn sees Angelique lying dead on the floor, after her murder at the infamous seance that Carolyn did not attend. And lying on the floor next to the remains, there’s the head of a hatpin. That’s the whole thing, not a lot to shriek about. But Carolyn shrieks like she’s being attacked by parallel pig weasels, and Julia comes running. “I remember it now!” Carolyn cries. “I know who murdered Angelique!” But the dream only told her something that she already knew, and it’s not a very interesting revelation. Also, it wasn’t a dream. This begins a five-minute long scene which turns out to be entirely circular. First, Carolyn refuses to tell Julia what she’s talking about, and then she claims that it was just a dream, which it wasn’t. Then she says she doesn’t remember it. Then she says she doesn’t want to discuss it anymore, and runs upstairs. Now the House Intelligence Committee needs to get a subpoena. By the way, neither Carolyn or Will were at the seance where Angelique died. When they did the re-enactment two months ago, they said that the attendees were Angelique, Quentin, Cyrus, Sabrina, Bruno, Elizabeth and Roger. Quentin refused to be part of the re-enactment, so they left an empty chair for him. 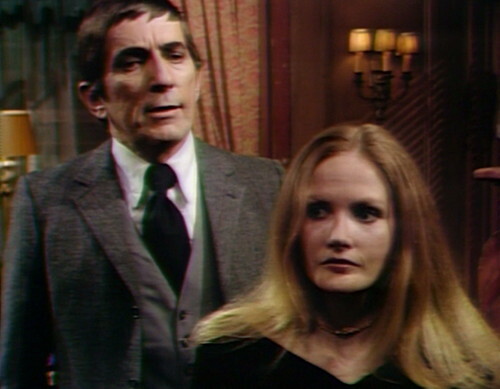 I know that they couldn’t include Carolyn and Will when they did the re-enactment because those actors were filming House of Dark Shadows, but either this is a murder mystery or it isn’t. It’s nice that they’re finally getting around to introducing some clues, suspects and motives, but audiences are good at retaining visual information, and we know Carolyn and Will weren’t at the scene of the crime. This bothers me a lot more than it bothers them. Anyway, the answer is no, Will didn’t kill Angelique, so after a couple fruitless minutes chasing that idea, Carolyn comes back downstairs and admits that she thinks her mother killed Angelique, because Liz has a hatpin collection. They’ve known for a week that Angelique was killed with a hatpin, and now is the first time that anyone’s remembered that Liz has a whole box full of them. I wonder who she killed with all the other ones. But Carolyn tells him that Liz had a motive — Angelique was driving Will and Carolyn apart, and Carolyn told Liz that she was going to leave him. Liz was upset, and that was just before the seance, so obviously she went to her room, selected a hatpin, and silently inserted it into Angelique’s brain cavity without anyone noticing. That wasn’t even a thought-out plan; it just came to her all of a sudden. Elizabeth is secretly Jason Bourne. 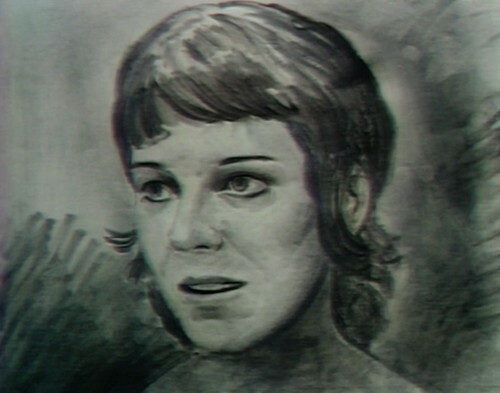 Carolyn asks Barnabas not to tell the police — it was all her fault anyway, Liz has had such a sad life, and so on. Barnabas says, “Carolyn, I won’t say anything to the police until we have further evidence, but we cannot ignore the fact that that hairpin was your mother’s.” Of course, someone could have taken it from her, which brings us right back to the beginning of the conversation. So the thing is, David Selby’s on vacation for two weeks, and they have to figure out what to do without Quentin. The Parallel Time sequence only has two storylines — the Jekyll/Hyde story, which is over, and the Angelique-Quentin-Maggie love triangle. If Quentin’s hiding out somewhere for a couple weeks, then all we’ve got to focus on is Angelique. Last week, there was a lot of plot movement — Julia killed her parallel self and took her place, Bruno found Cyrus’ journal and gave it to the police, Barnabas and Julia discovered that there’s a pretty young woman who’s supplying Angelique’s undead life force, and Quentin and Angelique teamed up to murder Bruno. This week, once Quentin escapes from the police, the pace slows down noticeably. Yesterday’s episode was basically four people walking in circles and recapping each other’s conversations. Today’s episode is mostly about hatpins, plus Julia and Barnabas recap yesterday again. They’re basically just keeping themselves busy, while they wait for Quentin to come back for the season finale. So we should talk again about the Second Law of Thermodynamics, which says that a system needs new sources of energy to be introduced, or it slides into entropy. Energy can’t be created or destroyed, but it can transform into a state that you can’t use anymore, so a completely closed system will gradually slow down until it comes to a complete stop. This little four-month bubble of Parallel Time is something of a closed system itself — there are no secrets from the past intruding on the present-day, and nothing that happens to these people has consequences for the actual Collins family that we care about. And they’ve been leaking energy like crazy lately, getting ready to wrap this storyline up. The Jekyll/Hyde story is dead, taking Cyrus, Sabrina and Buffie with it, Bruno is dead, and by the end of this week, another character is going to die. We already know how Angelique came back to life, and now that they’ve introduced the woman supplying her with life force, we’re pretty sure we know how that story thread is going to end. Now, Julia’s arrival is a perfect example of new energy coming in from the outside — actually hopping between dimensions to replace her doppleganger — but that means that we lose Hoffman, who was also a source of weird narrative energy of her own. So Parallel Time is kind of an experiment in what happens when the Dark Shadows writers run out of new ideas, which it turns out is an even bigger problem than just getting back to our home dimension. There’s four more weeks in Parallel Time, and then they have to figure out what to do next. 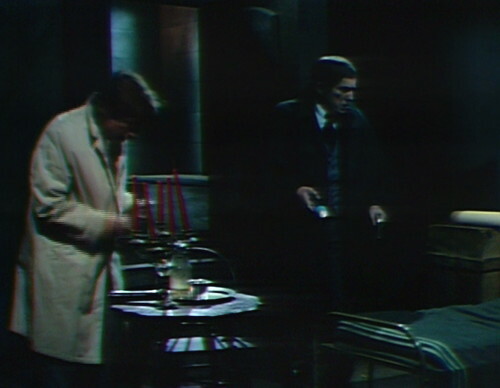 According to The Dark Shadows Companion, executive producer Dan Curtis gathered the show’s three writers for “a 52-hour marathon session, looking for the sure-fire storyline, reexamining all that had gone before.” They came out of that story meeting with the 1970/1840 storyline, and I guess they really did reexamine all that had gone before, because it’s basically the Turn of the Screw story from 1969 paired with the witch trial story from 1967. The thing that makes that story believable for me is the “52 hours”. If they’d said 48 hours, then you’d figure they worked for a couple days, no big deal. But 52 hours means that it was so exhausting that you remember exactly how long it was. 52 hours means you get naps and meal breaks. Obviously, they had problems figuring out how to get new energy into the system. Dan wanted a big new thrill-packed story, and they’d already stolen every classic horror novel and monster movie available to them. Cribbing material from famous people isn’t actually the only way to write a soap opera, but it’s the only way that Dan knew. After 52 hours, you say fine, we’ll do Turn of the Screw again. You’d say anything to get out of that room. So that brings Barnabas and Willie back to the secret room in the Collins mausoleum, to unearth the only scrap of new energy the writers can think of, after 52 hours with Dan. His name is Claude North. Barnabas wants to defeat Angelique by waking up the lady in the back parlor, breaking the witch’s life force supply chain. But they’ll need a place to stash her, so he figures he’ll use the secret room, if there is one in this timeline. There is, as it happens, but it’s occupied. Someone’s been living there, and sleeping there, and drinking milk there. Barnabas finds a charcoal sketch rolled up on a packing crate, and it turns out someone’s been drawing there too. The picture looks like the beautiful life force donor, and the signature at the bottom says “Claude North”. “Was this where she lived before, or he did?” asks Barnabas, rhetorically. Although there is a way, obviously, which is to close the door and wait for whoever’s living here to come back, but you can’t think of everything. So that’s what we’ve got, to tide us over for the next couple weeks: an unconscious woman, and Claude North. He’d better be a real ball of fire, that’s all I’m saying. 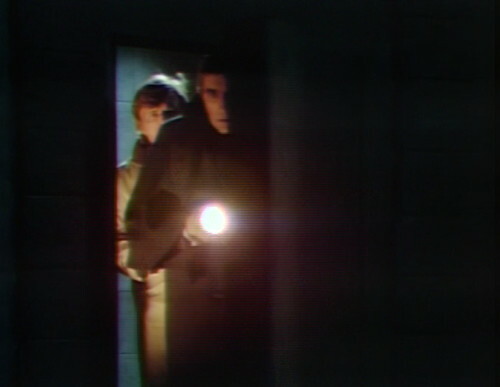 When Will opens the basement door, there’s a boom mic hovering over Barnabas and Julia at the top right. Several times in act 1, you can see the edge of the Old House drawing room set; the yellow wallpaper stops about halfway up the flight of stairs. When Will leaves the Old House, a shadow passes over the basement door. When Barnabas and Carolyn sit down on the couch, the boom mic drops into the frame at top right. When Barnabas says, “We cannot ignore the fact that that hairpin was your mother’s,” he means hatpin. More drama around the voodoo doll — for the last couple episodes, they’ve been pretending that a little marble bust was actually a voodoo doll. Today, Julia says that the object Maggie found in her drawer was “a small clay doll”. They need to make up their minds. Will lights some candles in the secret room, which are supposed to illuminate the scene. You can see the moment when the actual studio light is turned on, reflected on his back. In the secret room, Will says, “Well, it certainly cannot hide her here.” He means we certainly cannot. I said that Quentin was on vacation for two weeks, which is mostly true, but he does actually appear in one scene next week, at the end of episode 1047. Then he disappears again and doesn’t come back until 1051. The Smith Brothers mustache portrait is hanging up at Stokes’ place. We last saw it in Alexis’ room in May. They should have gotten Henry Slesar (The Edge of Night) to have ghostwritten this storyline, complete with the parameters that key cast members were going to be gone for periods of time. I think he could have come up with something memorable. So David Selby takes a two-week vacation during this crucial part of the story. It seems to me that it would have made more sense to move his vacation to the two weeks when Barnabas and Julia wind up in 1995. If that particular storyline needed Quentin so badly (which I think it wasn’t completely necessary), they could have pre-taped some scenes with him to roll in while he was on vacation. If Elizabeth found out Angelique was driving Will and Carolyn apart, she’d have sent Angelique a heartfelt Thank You note and a nice fruit basket. She would not have stuck a hat pinin her skull. Any mother, worthy of the name mother, would welcome the chance to see her daughter rescued from marriageHell to Will Loomis. Even if this line were said correctly it would be retarded. Sam Hall–really? Yeah, Barnabas has “had work transferring life force” the way lab rats have had work testing the hazards of cyclamates. It’s odd how one-sided Parallel Time seems. People from Real Time can cross into Parallel Time, but PT people can never slip into RT time. And when the room changes in PT time, it does so only for RT people to get back into their own time. The only thing from PT that ever made it over to RT was Will’s book. At least with the 1897 story there was always the threat of Petofi finding a way of traveling to 1969, which would have been a way of continuing the story and raising the horror factor for the present day period. Instead, Dark Shadows is becoming more compartmentalized, where one story has no real connection with, and only loose continuity to, the next. Imagine if PT characters had discovered a way through to what would be Parallel Time for them, the real and present day Collinwood. 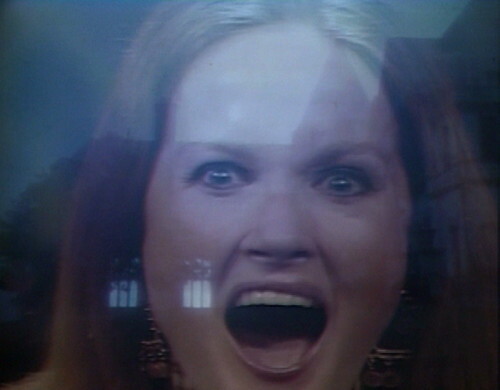 Imagine two separate Angeliques teaming up in present time Collinwood and trading notes on black magic to add mayhem and madness for when Barnabas and Julia return from PT — which, in fact, would force them to make a speedier return. I’ve fantasized about a Classique Angelique / PT Angelique meet-up, but I really doubt they’d form an alliance. I think they’d instantly wary and suspicious of each other. PT Angelique gets the edge on cleverness and blending into the Collins family but, but Classique Angie is a full-on witch. Unless PT Angie could lure Classique Angie into an embrace and chill her out, I don’t think PT Angie would win the match-up. Where they really missed the boat was with PT Roger. Let him get away with his crimes and find a way to Classic Collinwood. He kidnaps Classique Roger and begins a campaign to gaslight Liz and takeover Collinwood. They said they ran out of ideas, but they just weren’t trying that hard. There’s one born out of a storyline that wasn’t a runaway success. As we will learn there’s some kind of unwritten supernatural law that prevents real time/parallel time characters co-existing near each other for more than a few minutes. It’s basically the Blinovitch Limitation Effect from Doctor Who, which holds that any time travel or parallel universe situation that’s too difficult and expensive to film is only possible for one or two scenes. What a hoot it would have been to see PT Roger go up against Real time Liz. My money would be on her – she wouldn’t hesitate to pick up the fireplace poker if PT Roger got too tiresome. Yep. PT Roger would have the early edge because of surprise, but RT Liz would eventually gain the upper hand. It’s a shame Barnabus and Julia didn’t return from PT just in time for Count Petofi’s return. Did I miss a point (no pun intended)? 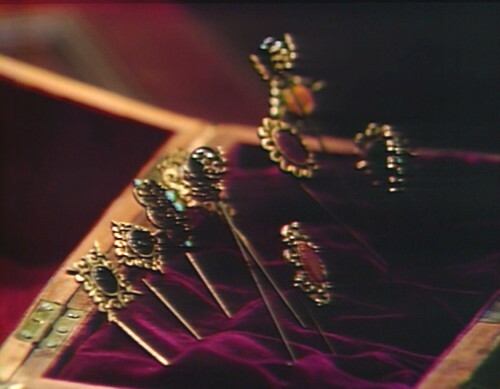 When Angelique was killed, the head of the hatpin came off and was found by Cyrus. So the rest of the pin should be – in Angelique? The hatpin broke off. Yet now, it is back in the collection that Liz wants to sell, seemingly none the worse for its venal venture…so Cyrus must have extracted the broken end from Angelique, taken the pieces and had them repaired, and sneaked the pin back into the box, all to protect Quentin’s good name? I don’t think the fatal hatpin is back in Liz’s collection. The head ended up on the floor, and Cyrus presumably found the pin during the autopsy. They didn’t say if Liz noticed one was missing. 52 hours and the result was the 1995-1970-1840 nonsense? Good night! Huge missed opportunity having there be no secret room/some alternate US history. A lot to discuss here for sure. — The hatpin conundrum is too headache-inducing to make sense of it. Maybe Carolyn is the only one who knows about her mother’s hatpin collection. But it doesn’t explain how she suddenly remembered it. Maybe Carolyn and Will were’n’t participants in the seance but they could have been visiting Collinwood that night and happened to be in the study and came running when they heard the commotion. — I certainly understand the ideas that came out of that brainstorming session. Those who write and or produce entertainment (art, music, books, plays/musicals, movies, tv) have forever been doing this. It’s the desire to recapture the magic and success of something that has come before. I think the 1995 segue between PT and present time was a good first step. Short & sweet and creating a whole new mystery. But the present day plotline that followed was frustrating to me in spite of some really good twists. Part of the frustration was that it was too short. Tony, I agree with you that the return to 1970 from 1995 was too short and needed more storylines going on. It needed to build and needed to reflect what characters like Mrs. Johnson, Prof. Stokes, and Carolyn had told Barnabas and Julia in 1995. The 1840 story should have also reflected what was reveled in 1970. What’s the significance of the playroom, the carousel, the Rose Cottage doll house and the zombie pirates? It’s as if the writers got amnesia and totally dropped all of the mystery set up in 1995/1970. Yes, they set up quite a bit for 1840 and somehow it seems they ignored a lot of it like you mentioned. At one point it seems like David Henesy left the show (high school?) and they had to drop the Carrie-Tad plot which certainly was key to 1970. But I mean, look what she keeps the hatpins in! It’s glorious! Maybe they are evil hatpins with their own agenda? Not Levia-pins! They formerly belonged to count Hatoffi! And it carried over into Night of Dark Shadows too. Has anything ever been written or mentioned about the multiple Karlen-Barrett pairings? I would assume fan mail response might have been at least one reason. Or was it just convenience? One has to wonder what would have happened had DS lasted to return to 1971 Collinwood. Would they have been able to come up with a way to make Willie and Carolyn a thing? My guess would be, if they had gone back to 1971 Collinwood, that we would have found out that Willie had a heretofore unknown identical twin, or John Karlen would have played a different character who would have gotten involved with Caroline. I think putting Caroline and Willie together would be too hard a lift. Both characters had been around too long and had never been seen as having romantic potential. However, Karlen and Barrett had mad chemistry and I think the show would have found some way to capitalize on that. Carolyn has seen the good in so many others, like Adam and Jeb, maybe they could have had Willie perform some unselfish, loving act that won her heart. Not sure what would qualify, but in soap opera, anything is possible! Absolutely – Carolyn and Willy would have been as great a super couple as Luke & Laura! Willy’s rough around the edges, quirky and funny yetburning with passion – and fiercely loyal and Carolyn’s a bit fragile and scarred but deeply understanding and loving. God knows Collinwood could have used an infusion of Willy’s energy. 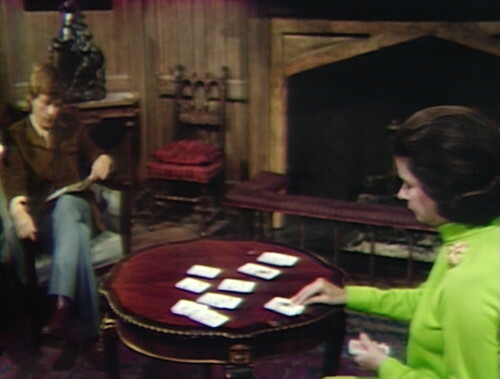 I surely would have followed Willy and Carolyn to a Dark Shadows spin off show if only we had been so lucky. Too bad they wasted so much time on that pretty boy Selby who never pulled off a believable romantic pairing with anybody. 1840 I consider another band of Parallel Time that the staircase led to. Hallie opening the door caused it let the ghosts from 1840 to cross over. Could be. There’s certainly no law — at least mentioned — that says there’s just one other band of parallel time. I say there’s a total of nine. There are three dimensions. Three cubed is nine. So nine possible universes to fit into 3cubed folds. Great. Somebody broke the MacGuffin. WATCH DARK SHADOWS on Amazon Prime, Hulu Plus and YouTube! AMAZON PRIME has every episode of Dark Shadows available for streaming! HULU PLUS currently has the first two DVD collections (episodes 210-290) available for streaming, as well as a rotating set of five sets of 40 episodes. It looks like they're only licensed to have a certain number of episodes up at one time, so periodically, they take down some sets and put up another batch. 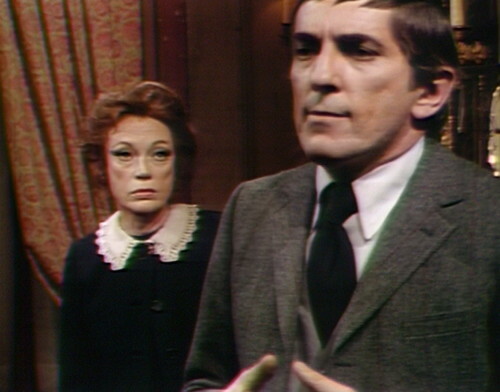 YOUTUBE is offering every Dark Shadows episode for pay-per-episode. Individual episodes are $2, or you can get 40-episode sets for $1 per episode. © Danny Horn and Dark Shadows Every Day, 2013. Unauthorized use and/or duplication of this material without express and written permission from this blog’s author and/or owner is strictly prohibited. Excerpts and links may be used, provided that full and clear credit is given to Danny Horn and Dark Shadows Every Day with appropriate and specific direction to the original content.